Specialising in the production of express cruisers and flying bridge crafts, the Tuscan shipyard Gianetti, recently expanded its target by moving upwards, setting in motion the planning and production of motor yachts from 24 metres onwards. Thanks also to the improvement of its production facilities, Gianetti had already started work on the construction of the Navetta 24 and the follow on model Navetta 32, designed by CLM in Viareggio for one of the shipyard's loyal clients. It is a flying bridge motor yacht destined for long oceanic crossings, built with a steel hull and aluminium superstructure in line with Rina's "Charter Class"classification standards and in compliance with both "Green Star" pollution free provisions and the regulations on noise transmission and vibrations, to obtain the "Comfort Class". In order to achieve good cruising autonomy, the Navetta 32 offers a very spacious structural double bottom, with watertight bulkheads divided into sectors, that not only hold a large quantity of liquid, but also guarantee safety in the event of a collision with floating objects. 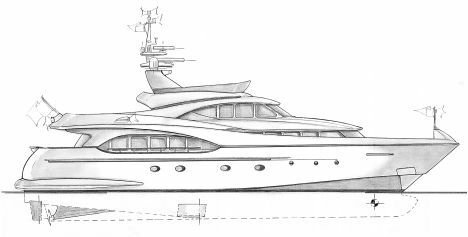 The design drawn up by CLM presents a classic yacht, alleviated of its grandeur by the lines that can be found almost all over the superstructure. As far as the layout of the interior is concerned, the owner requested a fairly classic arrangement of the living and sleeping quarters. The fore area of the under deck houses the crew's quarters, with three double cabins and as many bathrooms again, a dining area and laundry room. At the centre of the boat, on the other hand, we can find the guest area,with four double cabins, each with en suite bathroom. The rest of the bridge houses the engine room, where we can find two Caterpillars with 1,100 HP each and the hangar where there is space for a stern drive power boat. Another tender, a classic Rib with 4 stroke outboard engine, is located at bow, on the deck. Inside, the space at bow is entirely dedicated to the owner's apartment, while, if one heads towards stern, the layout offers a galley, dining area and lounge. The upper bridge has two distinctly separate areas, one closed off at bow where the full beam wheelhouse is located and a small dinette, that can be added to the open air one found on the stern extension, complete with dining area and Jacuzzi. The fly or sun deck, is fitted with numerous seats and sun loungers for those who love sunbathing, and also houses a second steering position with duplication instruments and manoeuvres. The solid roll bar, with the aerials and flagpole is clearly visible on this bridge. For further information: Cantiere Nautico Gianetti; via Fosso Guidario 12; 55049 Viareggio (LU); tel. 0584 384655; fax 0584 392335; web site www.gianettiyacht.com; e-mail info@gianettiyacht.com. Engine: 2x1.100 HP CAT 3412.